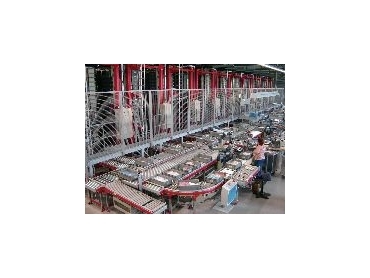 Using knowledge gained from the installation of an advanced order collation system for the American retailer Walgreen's distribution centre systems valued at $US 200 Million, Schaefer intend to feature a working model as one of the topics covered in a paper given by their keynote speaker at the interactive warehouse seminar section of the exhibition. In its automatic mode the Schaefer Satellite System can be left in the lane to 'auto stack' whilst the forklift driver continues other operations with other satellites. One RF controller can operate up to 360 satellites and each satellite can service up to 2,000 pallets that can work continuously for a period of 20 hours without recharging. An additional benefit is the ability to utilise 80% of any available warehouse space. SSI Schaefer have revolutionised the design of drive-in racking by developing a pair of rolled formed, galvanized, self centering pallet support rails which are bolted directly onto the upright posts. This new design eliminates the need to have arms and brackets that have been traditionally used in drive-in racking. By incorporating bracing towers strategically located to ensure left and right stability the new design provides increased strength and rigidity, which means Schaefer engineers are able to increase weight loading values providing a safer and more competitive storage solution. The top rail height level can exceed 10 metres and is available in lengths of up to 11,982mm.